Turbulent flow that impacts aviation can be caused by several different factors and can occur at both low and high-levels in the atmosphere. 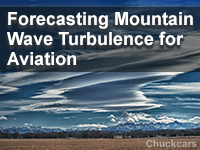 This lesson focuses on forecasting mountain wave turbulence. Its methodology relies on the spatial and temporal distribution of winds, stability, and clouds to forecast and verify mountain wave turbulence. Analyzed forecast products include NWP charts, cross sections and soundings, satellite imagery, RAOBs, PIREPS, and graphical turbulence guidance (GTG). The lesson is targeted for aviation forecasters at the U.S. National Weather Service (NWS). The module briefly reviews background concepts, but largely relies on the COMET lesson Mountain Waves and Downslope Winds for prerequisite conceptual material. Excellent material. Some of the information here is a bit advanced and taking lessons offered in the beginning of the lesson would have been beneficial. I am doing this as on the job training. The rule of thumb for tropopause turbc is 4000ft below to 5000 ft above. It was stated correctly initially then reversed afterward. This was the quiz taken before gluing thru the class, so any is it asking me this now? I have just started going thru the materials and hopefully it will help me get the answers correctly. I really like this course but very confusing with the terms instead. This course is good but could be better if examples from other regions of the world are included. Grammatical errors ... quiz questions were not very clear. Comprehensive coverage of mountain cloud dynamics. recomiendo hacer dicha prueba para confirmar tus conocimientos adquiridos en la universidad o el particular. Some of the sounding examples did not seem to be correct. They said they were weakly stable and they looked pretty stable to me overall. List the NWP forecast products required to forecast mountain wave turbulence for both enroute and low-level conditions. Estimate the intensity of the resulting turbulence. List in situ observations (e.g., Soundings, PIREPS, AMDAR, etc) applicable to forecasting mountain waves. Apply in situ observations when forecasting mountain wave turbulence. Describe the importance of communication and coordination to ensure consistency across forecast products for decision support.